Meat balls have won me tremendous complements each time I have cooked them. They are so consistent in bringing me instant gratification, the kind that comes when you see people enjoying their food. 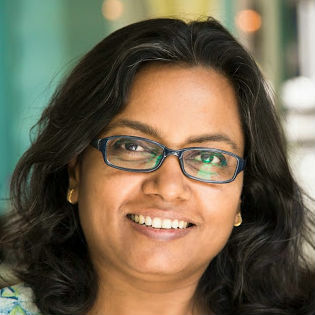 The kind when you see a kid eating slowly relishing the food on her plate. That is a precious feeling and I keep repeating such nutritious tasty foods that are loved by all. Failure proof I call them. I don't cook with beef mince (though I have no reservations in eating it) so the meat balls are either cooked with mutton mince or chicken mince. Chicken mince is easier as it cooks faster and makes your job convenient by saving you time while deep/shallow frying. No points for guessing that I use chicken mince most of the times when I do meat balls. To tell you the truth I like it more with chicken mince as I don't like my meat balls to be too meaty in flavor. Please feel free to use any kind of mince you like, you just have to add a little more seasoning to it as the red meat requires a bit heavy seasoning in them. Also, the cooking time will increase and you would like to fry them on a low heat to allow even cooking. You wont mind this little hassle if you like you meatballs meaty. Other procedures are just the same. However deep fried, the meatballs don't absorb oil while frying since no flour or breadcrumbs have been used in the mixture. Read the recipe. These meatballs are gluten free, that is if you pair them with rice or soba noodles, the meal would be absolutely gluten free. Here I served them with whole wheat spaghetti and the leftovers with whole wheat penne. I like adding some vegetables to my spaghetti and meatball platter, you see a bed of quickly stir fried spinach on these plates. It was an awesome combination and healthy to boot. Mix everything in the list together, it looks like this. Pinch out small portions, the size of small Indian limes and deep fry in hot olive oil or sunflower oil. You might like to shallow fry if you have a greater control on turning the meatballs swiftly so they don't break or become loose during shallow frying. I have no picture of a shallow frying stage as it was made for guests and there were too many things to handle within a short time span. Drain the meatballs on a kitchen tissue towel. Use as desired or refrigerate. The meat balls keep well in the fridge if you wish and can be reheated with a prepared sauce. My sauce for meatballs this time was a simple tomato concasse that I make for my pasta dishes. 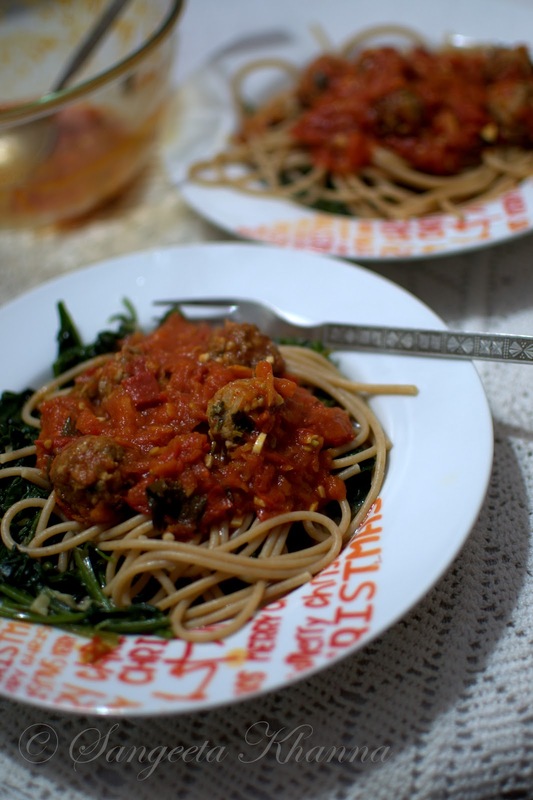 Here is another recipe for a pasta sauce or tomato concasse that uses red bell peppers. The simplest of pasta sauces these are. Use any of these to serve with these meat balls. Heat olive oil in a pan and tip in the garlic. Tip in the grated carrots as soon as the garlic starts sizzling. Stir fry till the carrot is limp and dehydrated. 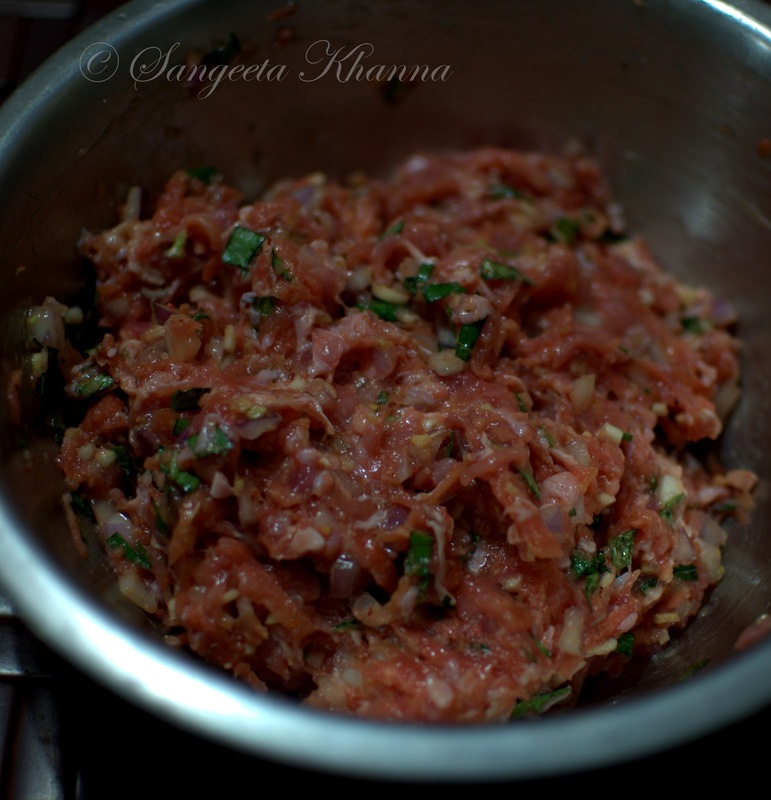 Add salt and red chilly flakes and then the chopped tomatoes and cook till soft and mushy. Keep stirring in between and reduce the sauce til thick and creamy. Add the tomato ketchup is using and mix well (add 1 tsp sugar to balance the taste if not using ketchup), add the herbs, mix and use as desired. Mix the fried meat balls with this sauce and heat together till it starts sizzling. serve hot over freshly boiled spaghetti or any pasta of your choice. Heat the oil in a shallow pan and tip in the garlic immediately. Cover it all with roughly chopped spinach as son as the garlic starts sizzling. Sprinkle salt, mix lightly and cook covered for abut 5-7 minutes on low flame. 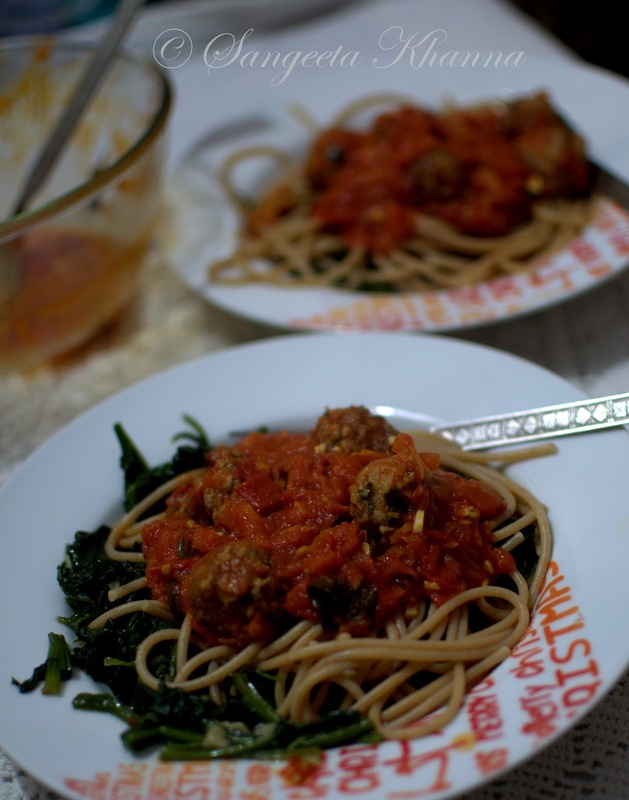 Serve as a base for spaghetti with meat balls or as you desire. 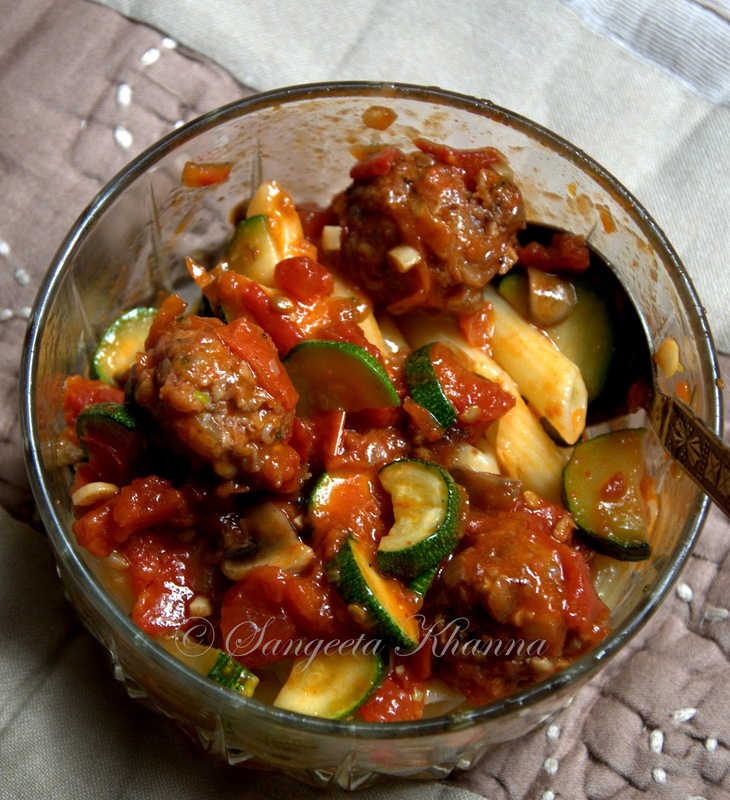 I stir fried some diced zucchini and mushrooms the other day and had the meat balls mixed with penne and this vegetable mix. Succulent and richly flavored meatballs without nay bread crumbs or flour to bind. And these bind very well to be fried and later are very soft and crumbly rather than firm and rubbery. Now you know how to make the meatballs really decadent. 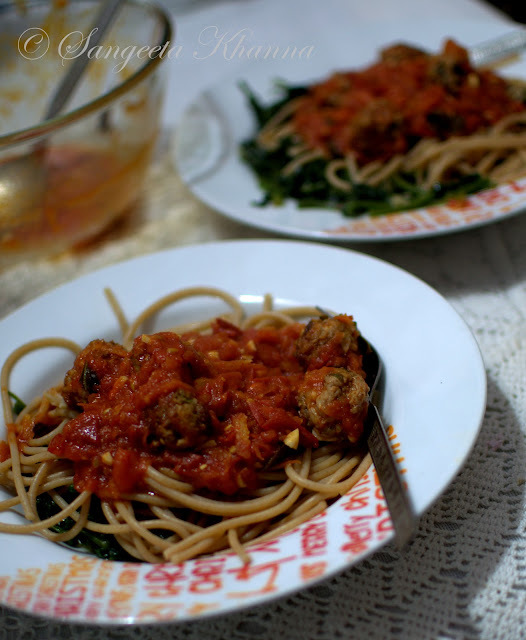 A flavorful sauce, soft and succulent meatballs and a little bot of pasta. Some more greens of vegetables if you are like me and you never would feel pasta is not a healthy meal.